@TriangleTesticles, "The Sun is not a star! It's the fvçking Sun moron. Git yo facts!" Yeah, Earth doesn't affect my life in any way. I could live without it. @Banetersaurus Rex, Matt Damon, is that you? Honestly, I don't personally believe in astrology (I'm 96% sure that's what it's called), but if the moon being full can affect how people act, there might possibly be something behind astrology that is worth studying. I highly doubt it, but just a thought. 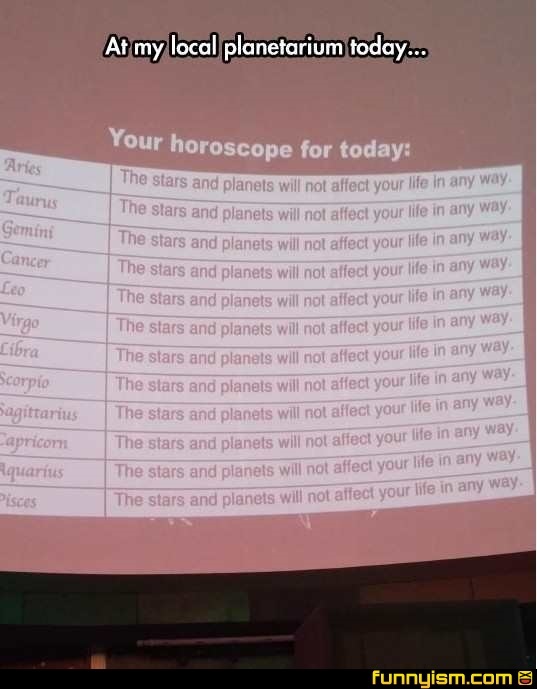 Would have been clever if they had actually given a horoscope on one of them... Kind of like "Except you sagatarius... Cause screw you"
Just because you think you can live without the sun doesn't mean the rest of us can.